Don’t be fooled by the low price you’ll pay for this Skywalker splitter. It’s an important part of any technician’s tool kit, and it has so many uses. It’s a low-noise, high-quality part that’s used in satellite and antenna installations and can work in so many different scenarios. 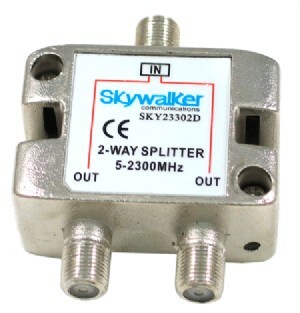 The point of this splitter is to give you the best possible method for splitting an antenna or satellite signal. It’s got really fantastic range, giving you the ability to split a signal from 5MHz to 2300MHz. That makes it suitable for almost every scenario except DIRECTV SWM and DISH signals after the multiswitch. It’s also power-passing which means that you can place it between a dish or amplifier and its power inserter, power injector, or power supply and you’ll be able to send that power where it needs to be. The power passes up the line and the individual ports are isolated so that there’s no chance of burning out another component with the voltage you’re sending up. That’s a pretty neat trick, if you ask me. These splitters are used to feed multiswitches if you need more than one, and can also be used to let you put a small TV near your amplified antenna for testing or just to watch TV up in the attic. Run the antenna to the splitter, and then use one line to go to the rest of the house (and any power supply you may need for the antenna amplifier) with the other line being used for the TV close to the antenna. While this splitter can’t be used for DIRECTV SWM, DISH Hopper or 722 (after the multiswitch,) it’s still a very effective part of a commercial installation. It’s used between the dish and the multiswitch to feed multiple multiswitches, and that gives you the ability to expand a satellite installation to the point where a single satellite could potentially feed hundreds of receivers.